Quick-Snap 2-Pack Sprinkler Kit [Quick-Snap 2-Pack Sprinkler Kit] - $79.95 : NewDaVincis.com!, Great Innovative Products, Gadgets and more. Never Move Your Sprinklers Again! The Inground Pop-up Lawn Sprinkler Irrigation System that lets you bury pop-ups anywhere without digging trenches or laying pipe! It consists of a K-Rain, ProPlus model sprinkler head with a SwingSnap Adapter. The ProPlus is a professional quality pop-up, gear-driven, sprinkler head with a patented adjustment dial and a five-year warranty from the manufacturer. One screw on the top of the head sets the spray distance and another screw sets the spray rotation. No other head is as easy to adjust. The distance can be set from approximately 17 feet to approximately 40 feet depending on your water pressure. The rotation circle can be set from 40 degrees to 360 degrees. 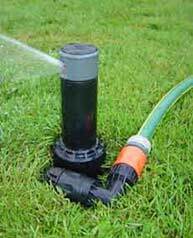 The Adapter allows an above-ground garden hose to feed water to the underground sprinkler head. The top of the Adapter is a garden hose quick-connect that swivels. Swing it up to snap on the hose. Push it down, out of the way for mowing. 2 Quick-Snap Sprinklers, 2 hose connectors, 2 capsÂ and a 'Y' connector. Most front yards can be completely watered using only two Quick-Snap Sprinklers. Just place them in opposite corners of the lawn. Their spray can cover squares and rectangles from edge to edge. Each connector has its own shutoff valve. The valve can be used to reduce throw distance or save a trip back to the faucet. Bury the largest model in a 4" hole, 9" deep -- dig it with a hand trowel. Set the spray pattern -- only once, you'll never have to do it again. Snap your hose on -- we provide the quick connectors. Turret pops up by water pressure, automatically. Turn off the water and the turret disappears back under ground. Mow right over it. Leave it in place year round. Take them to the new house when you move. 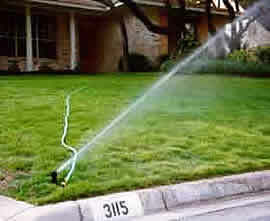 The ProPlus sprinkler head sprays water up to 40 feet. What?s so great about Quick-Snaps? They are so inexpensive! You can purchase them for a fraction of the cost of a system with inground pipes. We use premiun quality sprinklers. You don't have to move or adjust them. You can take them with you when you move. Or, you can add pipes later, if you want. Easy to install, you can have Quick-Snap Sprinklers up and running in less than an hour. And, they make great gifts!